The last few years have seen a great assault upon faith in the publishing world, with an influx of books denouncing religious belief. While attacks on faith are not new, what is notable about these books--several of which have hit the bestseller charts--is their contention that belief in God is not only deluded, but dangerous to society. In The Delusion of Disbelief, former Time senior correspondent and bestselling author David Aikman offers an articulate, reasoned response to four writers at the forefront of today's anti-faith movement: Sam Harris, Daniel Dennett, Richard Dawkins, and Christopher Hitchens. Aikman shines a light on the arguments of these "evangelists of atheism," skillfully exposing their errors and inconsistencies. He explains what appears to motivate atheists and their followers; encourages Christians to look closely at what they believe; arms readers with powerful arguments in response to critics of faith; and exposes the social problems that atheism has caused throughout the world. Aikman also takes on one of the most controversial questions of our time: Can American liberties survive in the absence of widespread belief in God on the part of the nation's people? The answer to that question, says Aikman, is critically important to your future. 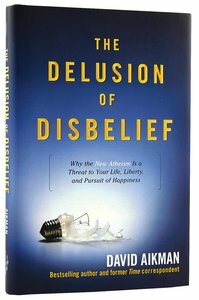 The Delusion of Disbelief is a thoughtful, intelligent resource for anyone concerned about the increasingly strident and aggressive new attacks on religious belief. It is the book that every person of faith should read--and give away. About "The Delusion of Disbelief"
David Aikman is a former Time magazine chief foreign correspondent who covered foreign affairs for more than 20 yrs. He is now a full time writer and has authored the novel When the Almond Tree Blossoms and a recent book On the Ground in the Middle-East. He resides with his family in Burke, Virginia. Customer Reviews For "The Delusion of Disbelief"
The rise of bold and eloquent atheist orators and authors in recent years has seen a comeback in theistic public debate. Richard Dawkins, Daniel Dennett, Sam Harris and the late Christopher Hitchens (the New Atheists) have been a driving force of this comeback. This contribution to the debate by David Aikman is interesting in that it covers a range of topics that have been addressed by this New Atheism. Science, religion, morality and politics are the primary areas covered by Aikman. Although there is nothing ground breaking in this book, it does provide a coherent rebuttal to some of the strongest and most aggressive attacks the New Atheists have on Christianity, and indeed theistic religion in general. Despite its small size, this book is well-researched and referenced, allowing for readers to dig deeper and draw their own conclusions on the author's opinions. This is probably the book's strongest point. Aikman's journalism background is put to good use in this very readable work.